At Action, Inc. we specialize in the following services. 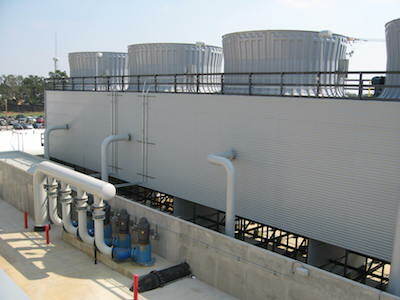 We assist you in determining project feasibility by providing conceptual estimates and constructive feedback from a nationally recognized Mechanical Contractor. We offer a team approach to reach your design and budget goals. 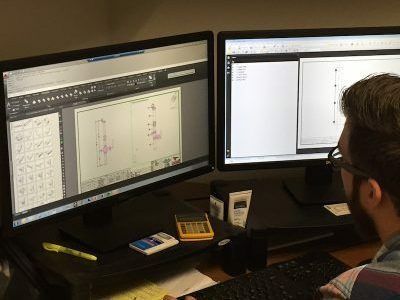 For projects with completed designs we can provide recommendations to assist with budget or schedule challenges. 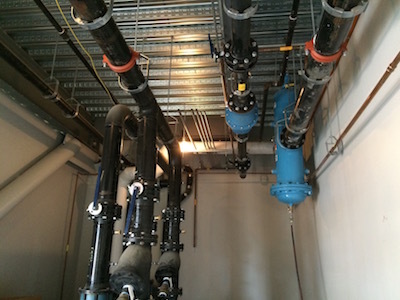 We can prefabricate much of our hydronic piping to improve quality and increase installation efficiency. 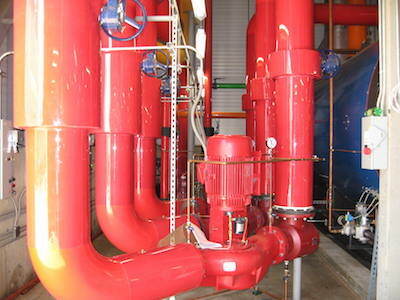 We can install all types including steel and copper pipe for hot water, steam, condenser water and chilled water systems. We are licensed to install and repair all types of plumbing systems including: domestic water, medical gas, sewer, storm, propane and natural gas. 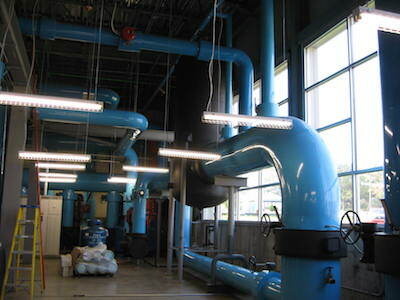 We provide installation and maintenance for all types of HVAC equipment and systems. Our full range of capabilities include split systems, packaged RTU’s, built up AHU’s, chillers, boilers, and VAV distribution systems. We design, manufacture and deliver in our 35,000 SF manufacturing facility. Ductwork and piping ranging from mechanical rooms to fixture batteries to below-grade rough-ins are prefabricated in our facility. 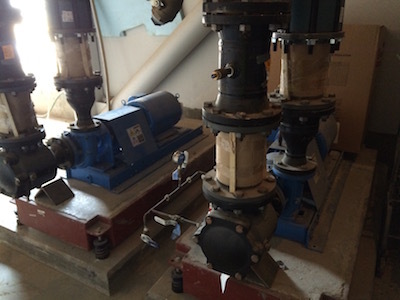 Click here to learn about the history of pre-fabrication. 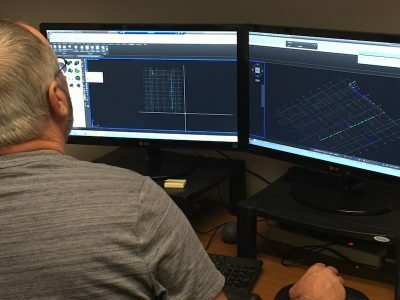 Autodesk Fabrication CADmep and CAMduct are detailing tools used to generate production drawings such as ISO spools, coordination overlays, or 3D spatial coordination with Navis Works. 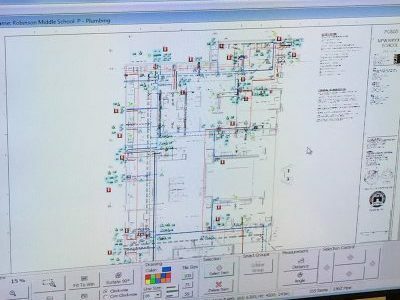 The use of Building Information Modeling (BIM) eliminates the inefficiencies of the traditional method of Design-Bid-Build and two-dimensional (2D) drawings by facilitating collaboration among project team members and by illustrating the project design through three-dimensional (3D) visualization. Trimble Job Site Solutions Total Station transfers CAD data to the job site via the Trimble MEP Nomad wireless hand held device. This technological leap eliminates the need for manual measurements on the job site, saving time and reducing costly errors. 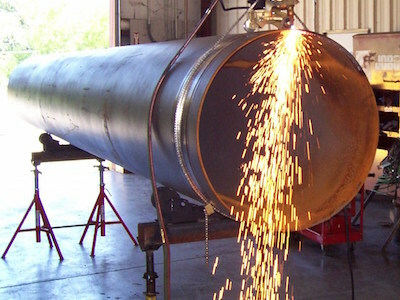 Click here to view more of our fabrication photos.